The centre of academic life at most universities is the library. The rows and rows of dusty, hastily-mended bound books and journals hint at a vast world of knowledge and draw a link between generations of students who have roamed the halls. But students in the engineering department at the University of Texas in San Antonio (UTSA) do not get that experience. Instead, they download whatever they want to any one of the terminals or their laptops. 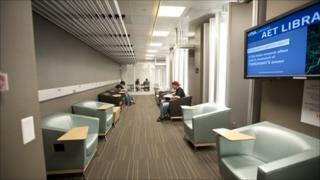 In September, the UTSA opened the first completely bookless library on a university campus in the US. The sleek glass library seats 80 people and holds 425,000 e-books and 18,000 e-journal subscriptions. And there is no need to share because all these budding engineers can read the same text at the same time. "With better search tools and an increase in the availability of digital content, finding information has become easier," says Krisellen Maloney, dean of libraries at UTSA. "Typically, we find more information than we need." The UTSA library is part of a trend. In 2000, Kansas State University opened an electronic library, but kept some reference books, An earlier this year, Stanford University removed all but 10,000 printed volumes from its engineering library. At the same time, despite the stigmas attached, more online-only educational facilities are springing up. And even now, children in some of the poorest parts of the world who could never afford an Oxbridge or Ivy League education can watch lectures from those classes on their computers. Higher education across the world is undergoing a seismic technological shift, which is changing the conventional thinking on what constitutes getting a degree. Students at UTSA have embraced their all-digital library, and even created a YouTube video about the experience. "The space we had for the library was limited, so we prioritised the needs and decided that an increase in study and collaboration space was more important than space for books," says Ms Maloney. How are sexually-confused insects helping small farmers? Library staff are now free to spend more time helping the students with queries rather than keep tracking and reshelving the books. And the library plans to offer pre-loaded collections of texts on iPads and e-readers for students to check out and take home. But academic publishers have been slow to embrace digital models of publishing, and for good reason. Educational textbooks are worth around $8bn (£5bn) a year in the US alone. Most students will remember their eyes watering when told they must buy the latest edition of an obscure textbook for a course - which happens to be available at full price from the shop across the road. So textbook publishers and booksellers have not been keen to kill the golden goose, and this has made it harder for innovators like the UTSA to stock every book they need. "The business models in publishing are changing but, in some cases, there continues to be a print bias," Ms Maloney says. "Some publishers have been slow to make all of their information available in electronic format." The Texan engineering library has a back-up paging service to have paper copies of journals sent over, but this has been used only a few times so far. The problem for the academic publishers is, of course, that they cannot charge the same price for e-books as for physical books. "Most of the academic publishers' business models are based particularly on first-year undergraduate textbook sales," says David Prescott, head of sales at Blackwell's, one of the biggest academic booksellers in the UK. "That model is still with us because the publishers are struggling to find an alternative." Digital books can also be shared and copied. Instead of 30 books for 30 students, the publishers are facing a drop in sales to one - or none. And that will affect the traditional campus bookseller too. "We have to find a niche in the supply chain to make sure we are still relevant," Mr Prescott says. Sites like the student-run Textbook Revolution aim to compile all the free resources available online to undercut the big publishers, including textbooks as PDF files. Still, the industry is fighting back. The Follett Higher Education Group has initiatives like Rent-A-Text, which preserves at least some of the returns of the paper model, and its CafeScribe e-book store and social network. Mr Prescott is also hopeful about Blio, an e-reading application that mimics much of the colour and flexibility of print - like the ability to share and highlight text. While the business model of academic publishers is being undermined, the university campus as a centre of learning is also under attack. In the US, Arizona is the heart of the online education industry. The University of Phoenix is the largest private university in North America, with 470,800 students enrolled, and a huge chunk of that is through its extensive online degree programme. Many such for-profit private universities have been criticised for accepting anyone and for lacking quality standards, but this education sector continues to grow. The Thunderbird School of Global Management, based in Glendale, has an MBA programme that lasts almost two years and most of the work is done over the internet. Besides the libraries, most sober students take away fond memories with at least one inspirational lecturer or tutor in their universities. But how does that change if your lectures are online? Universities themselves have rushed to put their lectures online. On iTunes, you can now get audio lectures from Oxford, Harvard and MIT on subjects ranging from the postmodern Russian novel to the history of biodiversity in Madagascar. The San Francisco-based website Academic Earth has video recordings of many of the finest lectures at these schools - for free. The top-rated course recently was a computer science course in the basics of machine learning and statistical pattern recognition at Stanford. What does it mean when a kid in Chile can cheaply download a formerly very expensive book or a Kenyan entrepreneur can absorb Cambridge's engineering degree on her phone? This is especially pertinent in the UK with the expected surge in the cost of higher education. Educators prefer to discuss how technology is making it easier to focus on the educating. "Digital technologies and the availability of digital content have allowed us to focus our teaching activities on higher-order skills, and this trend seems to be playing out in other aspects of higher education," Ms Maloney says. For example, with lectures posted online to be watched at leisure, teachers can spend their classroom time instead in more indepth discussions or one-on-one tutorials. "Research has shown that environments that combine digital and in-person are the most effective in terms of student learning," she adds. "There is plenty of work to be done before the university can transition to a completely digital library," she says.